We’d love your help. Let us know what’s wrong with this preview of The Battle to Do Good by Bob Langert. To ask other readers questions about The Battle to Do Good, please sign up. The author of this book is my brother, but I bought my own copy of the book and nobody forced me to read it. One of Bob's son-in-laws, knowing that I rate and review everything I read, kidded that he heard I might give Bob's book "only" 3 stars. I laughed, knowing that I would probably rate it 5 stars no matter what. But I will say this: this is a LEGITIMATE 5-star book. And I will explain why. Bob spent 4 years writing this book. That seemed like a long time. I wondered what was taking so long, The author of this book is my brother, but I bought my own copy of the book and nobody forced me to read it. One of Bob's son-in-laws, knowing that I rate and review everything I read, kidded that he heard I might give Bob's book "only" 3 stars. I laughed, knowing that I would probably rate it 5 stars no matter what. But I will say this: this is a LEGITIMATE 5-star book. And I will explain why. Bob spent 4 years writing this book. That seemed like a long time. I wondered what was taking so long, whether he would ever finish it and get it published. After reading the book, I understand better what Bob was doing for those 4 years. The quality of this book is extraordinary in so many ways. You can see the results of his extensive time and efforts. 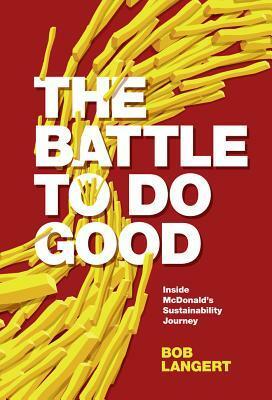 The book chronicles McDonald's efforts in Corporate Social Responsibility (CSR) over three decades. Bob is uniquely qualified to tell this story, as he was there from the beginning through 2015, when he retired. He could have written the book from his own memory and documents that exist publicly. That's NOT what he did. He interviewed 51 people in the process of writing this book to augment and corroborate his own knowledge and recollections. The way Bob weaved the results of those interviews into this book is masterful. Even though I also had a career as an executive in the consumer products industry, Bob opened my eyes up to the importance of CSR to the world and to major companies and their brands. Over these three decades, we see McDonald's move from a reactionary state, playing defense against accusations on issues such as waste and obesity, to taking proactive stances and actions to be a better corporate citizen. Admirably, Bob understates his own role in the tremendous progress McDonald's made during his career, instead lauding the numerous people he collaborated with inside and outside the company. Knowing how loyal Bob is, I wondered if he could be objective. Would this be too pro-McDonald's? Bob was objective, but at the same time you come away with a very favorable impression of McDonald's. But Bob was honest about points in time where he felt that the company's efforts were falling short. Or when the corporate bureaucracy held up decision-making. Strengthening CSR at McDonald's is quite a challenge. The vast majority of McDonald's restaurants are owned by franchisees, which limits how much McDonald's can control them. Many of the issues McDonald's dealt with involved their suppliers; in fact, even one more level removed (suppliers to McDonald's suppliers). For example, McDonald's got involved in fair pay for tomato growers. McDonald's does not deal directly with tomato growers, but their suppliers do. Bob effectively demonstrated how McDonald's tackled these challenges which were somewhat beyond their full control. He also explains why McDonald's chose to be involved when they could have easily turned their back on issues that more directly involved their suppliers. Though some might consider some of the subject matter dry, Bob made this book read like a novel. He set the scene, went over the thought processes and then proceeded to describe the resolution of the matters being worked on. I also especially liked how he added little descriptions of the many people involved in the issues at hand. Bob could have stopped after providing their names and titles, but instead he always took a little time to say a little bit more about these people. This helped make the stories in the book come to life. This book stands up as prime reading for anyone who wants to know about Corporate Social Responsibility. You get a career full of lessons in 250 pages. The Battle to do Good was an excellent read. Honest, thought provoking, and very well-written. The author, who worked at McDonald's for 25+ years, does a great job of walking us through the major issues that came up during his tenure, and what McDonald's did to combat them. It was a real first-hand look at his experience working with NGOs and internal colleagues, the good AND the bad (I was amazed at some of the stories he told!) It was super interesting, and felt very honest. The book is academi The Battle to do Good was an excellent read. Honest, thought provoking, and very well-written. The book is academic, yet very readable. It is laid out where each chapter addresses a specific issue, and how the company managed these issues (my favorite being the chapter about the tomato pickers, and their negotiation for a higher wage.) Each chapter ends with high level "Hard Knock Nuggets" that were easy to digest, and quite thought-provoking; great for those in the field. This book is a must read for anyone who wants to learn more about sustainability across food chains. Bob’s story is unique and intriguing, and even though I’ve known Bob for many years, I still learned fun facts about his journey. I’m energized and excited to put some of the hard knock nuggets to practice in my own journey.